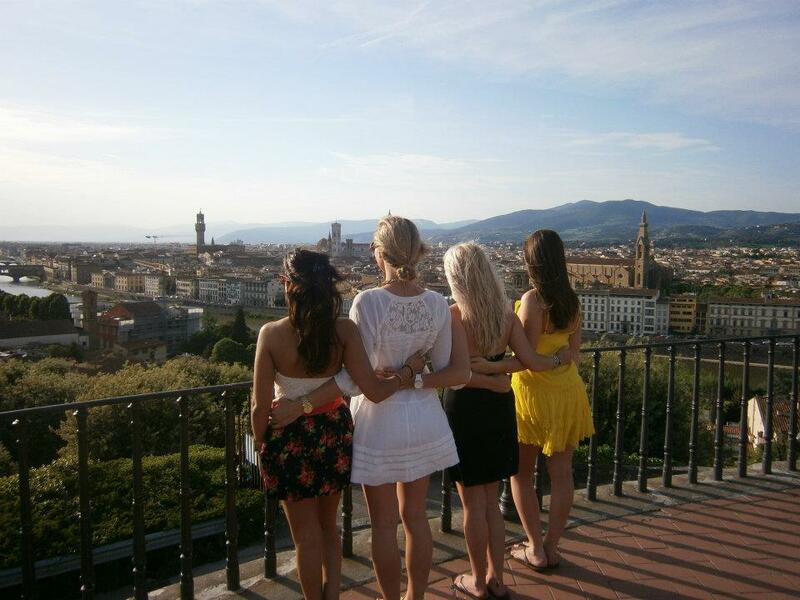 Studying abroad in Florence, Italy was a remarkable travel experience in itself. However, due to ample amount of time overseas and yearning to explore, I decided with conscious pre-planning and budgeting to set sail from my home away from home in Florence and discover new cultures in the European countries of Greece, Spain, and France. My first adventure began with an overnight cruise to the island of Corfu, Greece. My friends and I booked the trip with the #1 European Travel Company Bus2alps, and had a memorable time on their planned excursion. During my time in Greece I jumped the waves in the Ionian Sea, devoured one too many gyros, and even attempted to learn a traditional Greek celebratory dance, key word- attempted. Next on my travel list was a sporadic trip to Barcelona, Spain. Two friends and I decided to book a flight with Ryan Air to what later became my favorite visited country outside of Italy. My first stop in Barcelona was the warm beach on the Mediterranean Sea, followed by a night of shopping down the city’s most famous streets, “Las Ramblas.” While making my way through the city I viewed the enchanting Sagrada Família Cathedral, and thankfully discovered the Spanish delicacy, Paella, which quickly became my new favorite dish! Before my time abroad came to an end, friends and I booked one last excursion to the French Riviera. Our primary bus stop was to the popular city of Nice, where I admired oceanic views as well as inspiring French couture. In between our destinations, my friends and I took a train ride to Monte Carlo, Monaco to gamble at the world famous Monte Carlo Casino, which consequently was a loss in euros, but a gain in wonderful memories! My journey ended in the city of Cannes, where movie stars around the world gather for the annual film festival. These three trips fulfilled my experience abroad, and allowed myself to come home a more adventurous, knowledgeable, and cultured individual. Traveling while studying abroad is a factor I am most grateful to have experienced, and has inspired me to voyage to other new and intriguing destinations in my future. There we were: my seven best girlfriends and I sitting teary eyed at our favorite Ristorante La Giostra in Florence, Italy. The eight of us, sitting in silence, glancing at each other, the restaurant, the people, the food… all of us, making sure to take in every last detail, knowing it would be the last time we’d experience a moment exactly like this. Before my arrival to Italy, friends and family prepared me for the all too common, “culture shock.” Sleeping habits, language barriers, unfamiliar places, and loss of comfort zone were aspects that could have made the transition difficult. However, the moment my foot touched Italian soil, I knew something incredible was about to begin. The city of Florence had a magical way of pulling on my heart strings, making every detail shine a little brighter, every foreign word sound like a beautiful song, and every bite taste like a little piece of heaven. When lost, I explored. When I couldn’t understand, a smile was exchanged. When exposed to something new, I embraced it and let it influence my new, foreign way of living. At that last dinner, I understood that my time was up, and the next morning once I got on the plane to head back home to the US this reality would only become a memory. Home. The excitement of reuniting with family and friends, sleeping in my big bed, eating my favorite home cooked meal, were all things I focused on to make the transition back to Chicago a little less painful. After the first couple days, and getting my fix of all the details I missed while abroad- it hit me, that feeling I had escaped experiencing in Italy- culture shock. No one could have prepared me for the way I was felt after the excitement of coming home subsided. Reality hit me square in the face. Back to the same work, school, locations, and faces I had known my entire life. It wasn’t the case that these elements were flawed; it was my new way of thinking that didn’t match my old environment. I knew I had to be proactive and shake this horrible culture shock. I decided to make goals: Working two jobs to save money, do well in school to graduate in time, implement the way I saw the world in Europe to my bearings in the U.S., and continue to be the inspired individual I became while abroad. Until we meet again, Florence! January 5, 2004. I sit back in my chair, exhausted. Lunch has been a veritable tennis match. My new host family is crowding around the table, peeling apples and gesturing with their hands, speaking at top volume. They’re speaking Spanish. Thickly accented, rapid fire, Andalucian Spanish. I can’t translate fast enough. I thought I spoke this language? March 5, 2004. I sit back in my chair, laughing. After telling a story about my day at school, my señora has called me out. “Do you remember the day you arrived?” she asks. “When I asked you if you spoke Spanish, you said si, un poquito. You were lying!” And there I am, with my own thick accent and rapid fire Spanish, gesturing to emphasize my every word. I’ve stopped translating; I speak this language. Where will I live? This is one of the most popular questions from students when deciding where to study abroad. The answer: It depends. Many programs offer both on and off-campus housing: residence halls, shared apartments or host family placement, while other traveling programs may include lodging in hotels or hostels. While in the US, students often choose to live off-campus for the freedom it provides, bypassing on-campus living for an apartment with friends. Some may skip the host family option out of concern for that same freedom. You moved out of your parent’s house on purpose, after all. In my position, I have yet to see the “end result” of my choice to live with a host family. The relationship that started at that table in 2004 continues today, through Facebook and emails, right up to my host sister’s wedding this past June. When I left the U.S. as a 20-year old, I was hoping for a chance to practice my Spanish, a comfortable place to rest my head and maybe a recipe or two from my señora. What I received far exceeded those expectations, and shaped my interactions with Spain in an immeasurable way.